Scarlett Hearts is a brilliant wee site I came across recently where Charlotte, a 22 year old jewellery designer from Newcastle, has been selling her handmade pieces for just over a year. Her pieces are cute, quirky, vintage inspired and amazingly good value, so I caught up with her to find out the story behind the site! "By making my own jewellery I was making something unique to me, which is something which the high street struggled to offer anymore. Friends started wanting pieces of my jewellery and suggested I started selling it online, so here we are today!" Your prices are amazing! How? Why?! "I don’t like paying for overpriced costume jewellery so I don’t think anyone else should! I think there is always a high price tag with handmade jewellery when there doesn’t need to be and I want everyone to be able to wear cute jewels for a reasonable price! All of Scarlett Hearts' pieces are handmade and I source from all over the world to keep prices down. Some items are very easy to find and others may take weeks!" Some of my recent buys from Scarlett Hearts! So, what are the most popular pieces on the site? 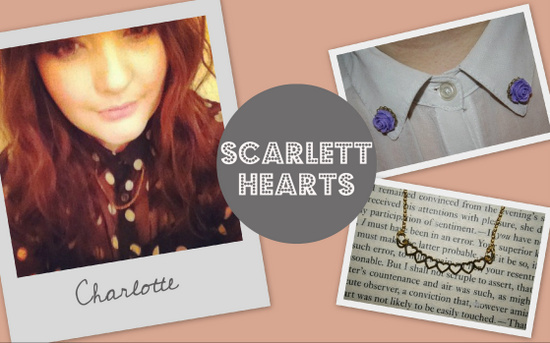 "The bestselling item on Scarlett Hearts is the cute Typewriter key initial necklace, £4.50, while my personal favourites are the RosyPins, £4. These are perfectly on trend with the colourful clothes in stores at the moment and make the perfect addition to your collars." And the next big jewellery trend? "We are thinking big, bold and bright for summer! Summer is the perfect time to let your imagination go wild!" Scarlett Hearts ships worldwide and charges a flat delivery fee: £4 for anywhere outside the UK, and £2.50 within! I've already picked up a few pieces as gifts along with a couple for myself - check out the site, and I'm sure you'll find something you love. ...like, for example, that Tiny Hearts necklace above? Well, you're in luck - I bought it for you! If you fancy getting your hands on it just follow the simple steps below. You just need to be following the blog through GFC or Bloglovin', though there are a couple of options for extra entries. It's open internationally - good luck! i love quirky little sites like this, great finds like!!!! I have entered, love that shop omg there's so much I want, totally bookmarked! What pretty things. I love the typewriter key necklace. Nice one Emma. Oh my gosh - these are amazing, I've spent the last few minutes trying not to buy everything on the site! Gorgeous! Follwing with GFC as Third Attempt, and mcgoverneimear@gmail.com on Bloglovin'! I see why the Initial necklaces are so popular, they're lovely! I have no idea if I have entered or not you make it kinda a challenge to do so, but here is hoping I have. Ok. . . did all the steps . . follow on fb and gfc, entered email address, so fingers crossed! Simply divine! 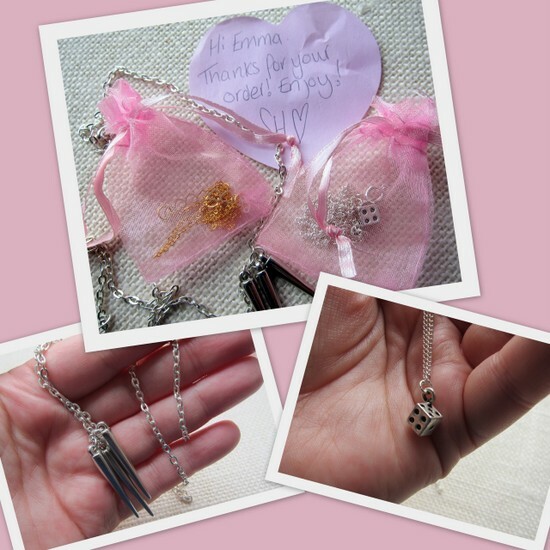 The heart necklace & Rosy Pins are so sweet. I can't believe how reasonable the prices are! I'm already bookmarking my faves! Following on FB and GFC! Hope you're havin a good week Emma! I love discovering new resources for great jewelry. Thanks for the intro and the giveaway! Ooh, her pieces are really cute! Love your site with such lovely original jewellery pieces! i am following you with google friends (: My name is Anna. Great prices and adorable pieces! I'll pop over to check out the website! Oh I love new-to-me jewelry lines! Loving so many of their pieces!! Adorable pieces and I can't get over the international delivery charge its brilliant. i'm following you via Twitter and GFC (Rose). Great giveaway!! Thanks for this wonderful giveaway! I'm a follower via GFC - Aik. Oh those pieces look so cute! Following on FB and Google. Hey Emma, looks a brill site, thanks for the recommendations !! Hi there, what a cute necklace! I am following on Bloglovin' (and also Facebook and Twitter).